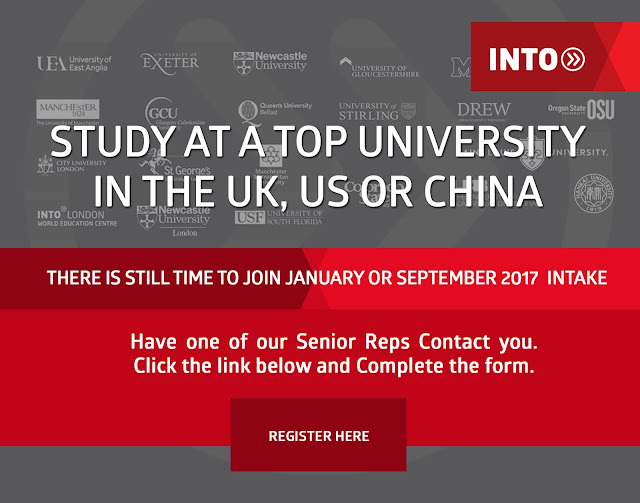 INTO University Partnerships offer international students entrance into one of its top ranking institutions and wide range of academic programmes. Have one of our representatives contact you. Click the link below to book an appointment. Holiday Predictions: Big buys, Bathrooms and Binge-watching Please wash your hands after shopping! Mobile phone retail company 3C HUB has promised to wow its customers this black Friday by providing mouth-watering deals to its customers both old and new. Are you a student of a Nigerian School? Popular mobile phone store; 3CHub has declared amazing discounts for students with a valid Student Identity card. According to a statement signed at the Lagos office today by the Digital Marketing Manager of the brand; Mr. Olamilekan Raji. 3CHub is offering students mouth watering discounts in different measures up to 5,000 Naira. These discounts were said to be dependent on the kind of devices purchased by these students. He added, "Our brand is committed to giving our customers the complete sense of affordability and we want to ensure students can affordably purchase mobile phones of their choice". According to him, the sales discount has begun already on the 24th of October and would end on the 24th of November 2016. Infinix Note 3 X601 Full Review: To Beast Or Not To Beast? In light of Nigeria’s recession, a lot of people are looking for good-looking ,durable, low priced and efficient smartphones that wouldn’t break the bank. The Infinix Note 3 X601 is just that. Now you reckon i have been using the Infinix Note 3 for over a month and i have gotten really comfortable with the form factor which anyone could expect from a 6-inch screen phablet device. Yes, the Note 3 is a phablet, however, its thin bezels may have you fooled into thinking it’s just a 5.5 inch phone because it fits into your hand just as easy. The Note 3 features a finger print sensor at the back and you can watch my unboxing video to see the improvements of the Infinix Note 3 over the Note 2. The Note 3 is also very hard to drop accidentally because it is not slippery at all. The third party cases are also readily available in the market and i bought a clear rubber case just to protect the shiny body after 1 month without scratches….what can i say, i’m a careful chap. It has only been 2 months since Infinix launched her new XOS UI for its new line of Infinix smartphones. Infinix pushed out updates to the Note 3 X601 barely one month after its official launch. Shortly after, infinix pushed a more extensive update to the Infinix Hot S. Some infinix users have taken to twitter to express their joy. This is good news to all infinix fan boys and girls because speedy updates are what you'd expect from the latest crop of Infinix phones. Upgrades usually come with a variety of bug fixes and cool features that you may have missed, however, I haven't experienced any bug with the old or new software version. If you're using any of these devices, you should have gotten a prompt for it but just in case you ignored it and you wish to update later, Check Settings > About > System update. Popular phone retail company 3C HUB is at it again. We have reliably gathered that 3CHUB would be having a massive promo to celebrate Nigeria's independence day. The activity which is been labeled 3C HUB Sales Promo would be running until 8th of October 2016. Customers can win a TV, pressing iron, and electric kettle. 3C HUB is in Nigeria to stay. The rate at which 3C HUB new outlets has been springing up all over the country speaks of a company that is ready to stay in the Nigerian market and probably own the market. From what we have observed they are not only here to stay but they also have their customers in mind by providing a very conducive place to shop, lowest prices in the country as well as a very good after sales service. Currently, they are running a promo for independence day and according to their Facebook page, there would be discounts on selected devices as well as a chance for customers to win a 32 inch LED TV, electric kettle and a pressing iron. STUDY IN AUSTRALIA WITH 2 YEARS POST STUDY VISA! Do you want to study in Australia with 2 years post study VISA or other countries like Canada, UK, USA, UAE and New Zealand, UAE? 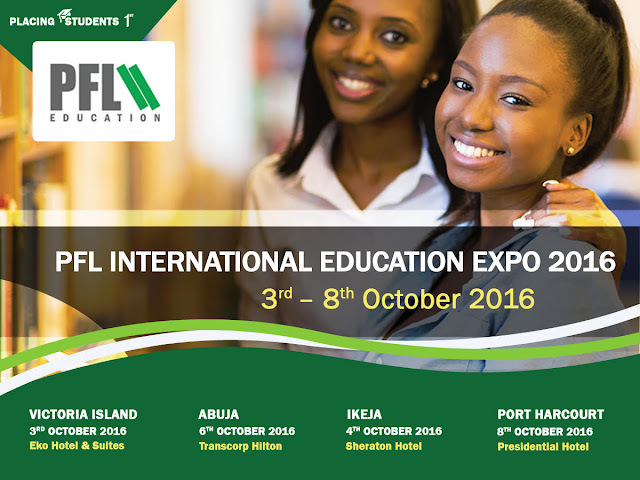 You can start your own inspiring journey to success by attending the PFL International Education Exhibition in October 2016. Do not miss this opportunity to meet one on one with seasoned experts from PFL Education partner institutions from Australia, Canada, UK, USA, UAE and New Zealand. -Over 19 years of fulfilling dreams -Over 250 partner institutions globally -Very high visa success rate for student visas -Over 20000 students successfully placed in different world-class schools -We are always ready to help a new student or re-applying students (Masters, PhD) -We will help you discover your potential and excel with it..
·Free Entry And Free Advice Services To All Attendees ·Find Out About Work And Study Opportunities that Meet And Suit Your Career, Aims and Ambitions.